Chinese culture is long-standing and splendid, and world culture is variety and brilliant. In December, 2014, there were enjoyable activities interlaced with Chinese and foreign culture, International Culture and Customs Festival. This event was organized by Student Union , in order to develop and expand Chinese culture, and show the international culture and custom. 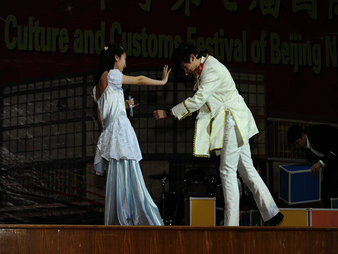 During brief activities, international high school student showed their country’s unique culture, and their own charm. 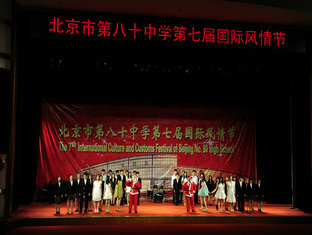 International Culture and Customs Week started on December 15th through meticulous preparation. 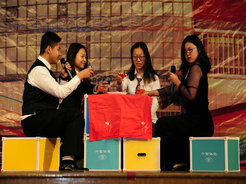 This Culture week lasted 5 days, include activities “lecture of overseas studies” , “A Bite of 80th high school”, “soccer show”, “international clothing exhibition” and “making dumplings”. These activities exhibited varied education styles, traditional foods, sport cultures through different forms. During the week, International students took part in each activity actively, tasted real different countries cultures and got knowledge. 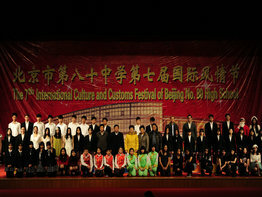 On December 24th, all the international students, teachers and part of parents got together in auditorium to welcome the most grand party—The 7th No.80 High School International Culture and customs Festival. There are some new features in this year’s party: hosts were from different countries, and all wore delicate Christmas hats. Drama and chorus are themed as Christmas celebration. Those features made the party more Christmassy while displaying Chinese and international Culture. The party, which students looked forward, started. It began with international students’ rock and roll, <21guns>, and . The song was performed with great vividness and deep affection. The solo dance performed by Ruan Wangshu tugged at audience’s heart strings, made a deep impression on them. The Peking opera displayed by both Chinese and international students was full of Chinese culture and international style. 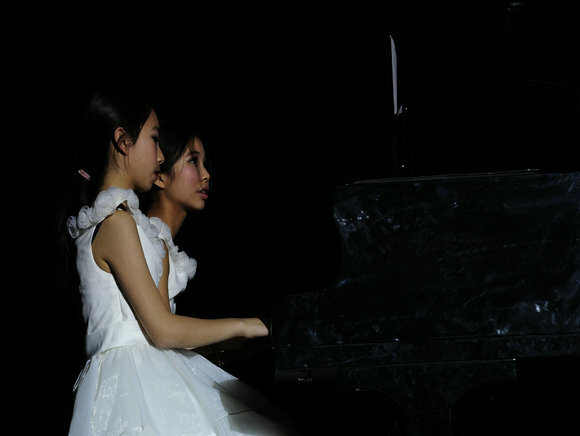 Directly afterwards, two junior high school students gave a magnificent performance of . 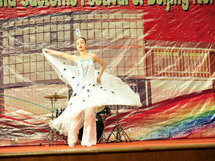 Then, the dance , performed by Korean students, came. Their dance have a distinctive style and the power of expression. Another dance was the folk dance brought by junior high school students, which is exquisite and graceful. Between two dances, there are classic three sentence and a half, and drama, . Although both of the shows gave students laughs, the former was simple yet fantastic, the latter was vivid and moving. 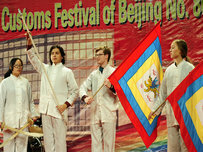 The semi chorus directly expressed international students’ deep love for China. The party was really amazing, all shows won audience’s cheers and claps. 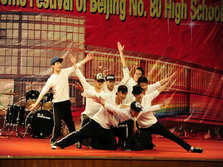 The ebullience hip-hop and showed the youthful enthusiasm of our students. Accompanied by sound of chorus, the party came to the end. 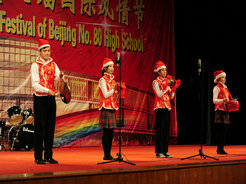 With the melodic music made by accordion, Chinese students and foreign students softly sang the song. Santa Claus went on the stage to give out his candies and pass on his happiness. 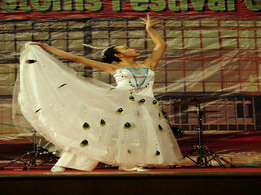 Beautiful dancer started to showing her best wishes by giving the audience the wonderful show. She would bring the happiness to every corner of the hall, everywhere of the campus, and everyone who was celebrating the Christmas. 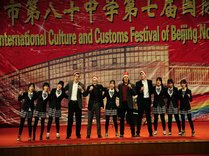 The International Culture and Customs Festival was happy and harmonious. 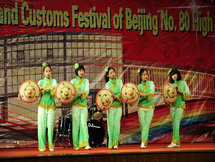 The International Culture and Customs Festival was colored by Chinese and foreign styles. The International Culture and customs Festival not only brought joy to the audience, but also provide students chances to show their talents and communicate with each others. I hope you can remember the song and dance on the stage. I hope you can remember the audience's smile and praise.